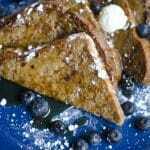 This Eggless French Toast is a delicious vegan take on the great breakfast classic. The secret? Nutritional yeast! In a medium-sized bowl, mix milk, flour, nutritional yeast, sugar, cinnamon, vanilla, and salt. Heat skillet to low/medium heat and lightly grease with coconut oil or a spray oil. Dip each slice of bread into mixture, flipping to ensure entire slice is covered. Cook on skillet about 5 minutes, flipping to cook each side until brown and slightly crisp. Serve immediately, topping with syrup, powdered sugar, or fresh fruit. Recipe from Live Eat Learn at https://www.liveeatlearn.com/eggless-french-toast/.